America's Funniest Guys Are GI's! 1st. Sgt. Puccinelli (Dean Martin) and Pfc. Alvin Korwin (Jerry Lewis) were childhood friends before Uncle Sam made GIs out of them. Bossy 1st. Sgt. Puccinelli is tried of training recruits and wants to go overseas to fight in the war while hapless Korwin is just tring to survive as a cook. Korwin, a Married man wants to go see his wife and new kid while Puccinelli tries to avoid a women he thinks might be pregnant with his baby while also courting another women. With all the mayhem of Army life, they still find the time to sing and dance in the Army sponsered show while tring to make the best of Army life. 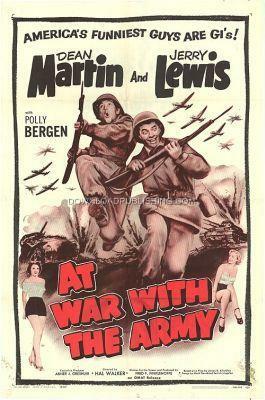 This is Dean Martin and Jerry Lewis's first movie together.